Your author learned rather too late about the Summer Festival at Kingsley Hall in Bow, attending an excellent showing of the play "When Gandhi Met Chaplin" there at the end of last week. Though the festival and play have now finished, the building's fascinating story - and its hosting of Gandhi on a trip to London - is always worth sharing. Following directly from Doris and Muriel Lester's nursery, which began nearby in 1912, construction of the current building began in July 1927, replacing a former chapel in the area that had been used as a community building. 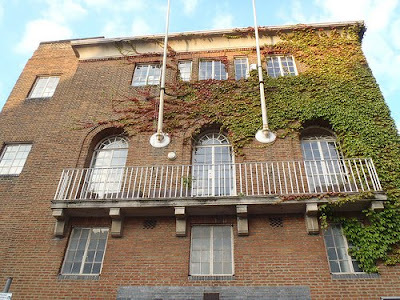 By 1931, the building had already become national news as the place where Indian spiritual and political leader Mohandas Karamchand Gandhi stayed on a trip to London to attend the Round Table Conference. Gandhi's room is still preserved on the rooftop, surrounded by offices where the Gandhi Foundation now base themselves. By the 1960s, pioneering psychiatrist and author of The Divided Self R. D. Laing took up residence with others in the building, which became the venue for experimental projects until it was wound up closed and boarded up in the 1970s. Briefly a film set for the filming of Gandhi in the early 1980s, it reopened as a community hall in 1985 and has been operating for the benefit of the local community continuously since then. Great idea! Well worth looking up the newsreel footage of Gandhi's visit to London, stopping first at Friend's Meeting House on Euston Road. Will definitely visit Kingsley Hall. Thanks as ever!